Bayer has made a business decision to voluntarily discontinue sales and distribution of the Essure® System for Permanent Birth Control in the United States after December 31, 2018. This decision is based on a decline in U.S. sales of Essure in recent years and the conclusion that the Essure business is no longer sustainable. Essure is the only FDA-approved non-incisional form of permanent birth control. The benefit-risk profile of Essure has not changed, and we continue to stand behind the product’s safety and efficacy, which are demonstrated by an extensive body of research, undertaken by Bayer and independent medical researchers, involving more than 200,000 women over the past two decades. Several factors have contributed to declining interest in Essure among women in the U.S., including decreased use of permanent contraception overall, increased reliance on other birth control options, such as long-acting reversible contraceptives (LARCs), and inaccurate and misleading publicity about the device. Bayer has informed the U.S. Food and Drug Administration (FDA) of the Company’s decision. The FDA has maintained for several years that the benefits of Essure outweigh its risks. Bayer is also informing healthcare providers directly of the business decision to discontinue sales of Essure. The health and safety of the patients who rely on our products is our top priority. Most importantly, we want to let the many women who have chosen Essure for their reproductive health know that our decision to discontinue sales is for business reasons, and not for any safety or efficacy concerns about Essure. 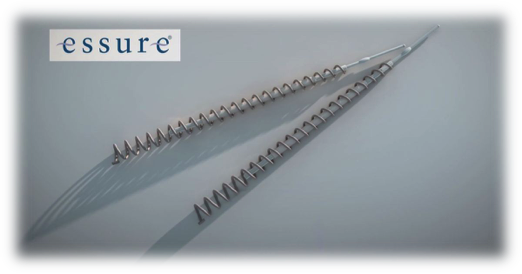 Essure’s safety profile has remained consistent over time. Women who currently have Essure in place may continue to confidently rely on the device, and Bayer will continue to support women with Essure and their healthcare providers. Bayer will continue to enroll patients in the Essure postmarket surveillance study and will work closely with the FDA to ensure appropriate follow up. Bayer will also continue to fully comply with its other regulatory responsibilities regarding Essure. Bayer remains strongly committed to women’s health where we have long been a leader. We recognize that women want safe and effective options that best meet their individual needs, and we are committed to continuing our investment, innovation and leadership in this important area of health. The iData report series on laparoscopic devices covers the U.S. and 15 countries in Europe including Germany, France, the United Kingdom (U.K.), Italy, Spain, Benelux (Belgium, Netherlands and Luxembourg), Scandinavia (Finland, Denmark, Sweden and Norway), Portugal, Austria and Switzerland. Reports provide a comprehensive analysis including units sold, market value, forecasts, as well as detailed competitive market shares and analysis of major players’ success strategies in each market and segment. To find out more about laparoscopic device market data, register online or email us at [email protected] for a U.S Market Report Suite for Laparoscopic Devices brochure and synopsis.